Ecocapsule is a small, egg-shaped abode that could be the perfect home for someone who wants to let it all go like Elsa and live off the grid. Its roof is decked with 600W solar cells and a built-in 750W wind turbine that store the energy they harness into a high-power battery. The structure's shape also allows its inhabitant to collect rainwater by placing containers around it. Since it measures just 14.6 feet long by 7.4 feet wide by 8.4 feet tall, anyone who isn't into tiny houses (and we do mean tiny houses) might feel more than a bit claustrophobic inside. Its designers, Nice Architects from Slovakia, made good use of every inch of interior space, though, fitting in a folding bed, a small kitchen, a dining area, a shower and flushable toilet, and even some storage space. The company doesn't have a price for the Ecocapsule yet, but it's presenting one at the Pioneers festival in Vienna later this month and taking pre-orders by the end of 2015. By the looks of it, Nice Architects is willing to ship out the capsules overseas, so long as buyers are willing to pay the rather hefty shipping price (around $2,400 from Slovakia to New York). 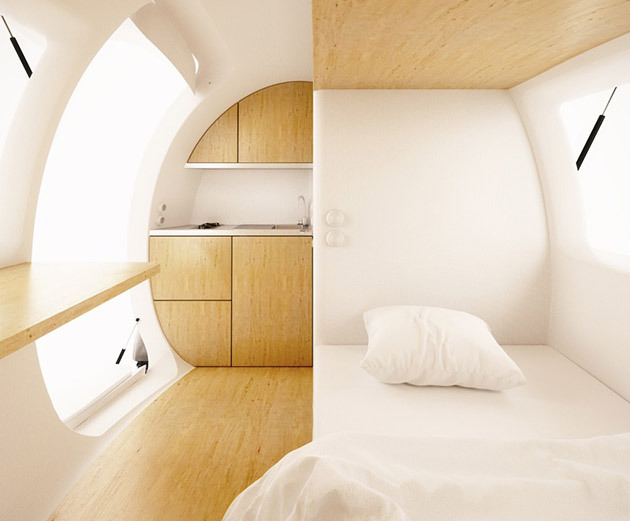 Once it arrives, the new owner can take the 3,300-pound micro home anywhere he wants.